- Isn't he magnificent! Blood red and battle ready— this dragon is ready for a showdown. Based on artwork by Anne Stokes. 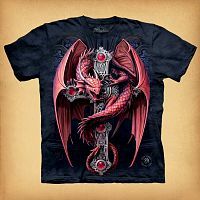 T-shirts are 100% cotton, and are printed with environmentally safe, water-based inks. Choose Size... Small Medium Large X-Large 2X-Large ($24.00) 3X-Large ($26.00) - 4XL (Special Order 3-4 weeks) ($32.00) 5XL (Special Order 3-4 weeks) ($32.00) Please choose the Size. *Note: We do not normally keep 4XL and 5XL sizes in stock, but will be glad to special order them for you. 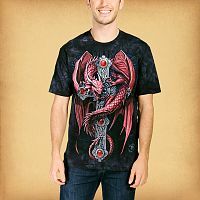 Do you have any other questions about our Gothic Guardian T-Shirt?